In the warm light of spring 2016, I flew to Sacramento, opened up Craigslist in the airport, and owned a 1970s Volkswagen two days later. It was a beautiful experience, and one that I should probably not repeat. With this in mind, please buy this beautiful Toyota Corolla before I buy another plane ticket. This is not the Toyota Corolla you know from Initial D and (hopefully) some really awesome Finnish rally videos. It’s the one before that. It’s a TE72, not an AE86. That’s fine. These cars are still rear-wheel drive, still super light, and still rocking a live rear axle. 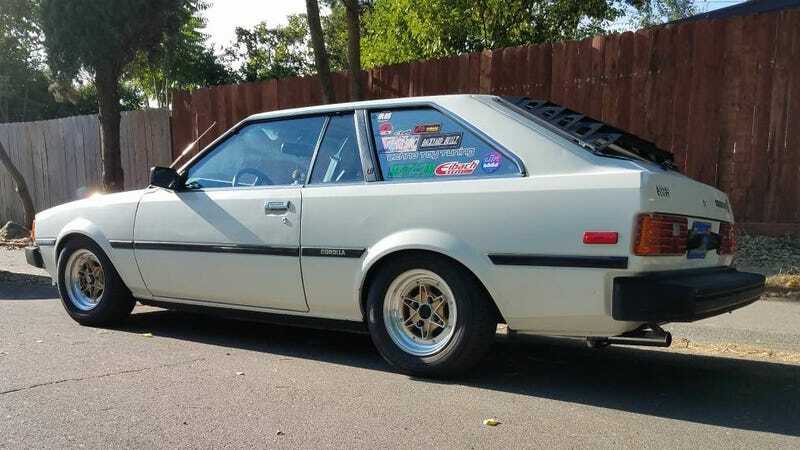 Much of the AE86 stuff fits on these very late ‘70s/early ‘80s Corollas, and they’re funkier and weirder than what turns up in the hachiroku crowd. The seller of this car, in low-rust Sacramento, wants four grand, but it comes with most of the work any retronaut would want already done. Dunlop TE wheels, AW11 MR2 seats, AE86 camber plates, coilovers and so on. The engine is factory, but that’s what a 200 horsepower BEAMS swap out of an Altezza is for. Find the full ad here. In any case, this is not a car that I need. Please make it go away. Make it go away into your driveway.